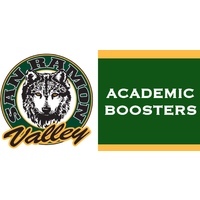 The SRVHS Academic Boosters is or school ed fund. A non-profit parent volunteer organization committed to supporting quality programs that enhance the educational experience for ALL students at SRVHS. Our primary goal for 2019-20 is to fund 18 class sections at an average cost of $21,000 per class. The suggested donation of $595 per student for the 2019-20 school year is 100% tax deductible and eligible for corporate matching programs. Over 85% of the Academic Booster budget supports additional class sections, reduces class size and allows for elective and AP classes that would not otherwise exist at SRVHS. Our goal is to fund 18 class sections for the 2018-19 school year. Supports TWO part-time Career/College Counselors in the on-campus Career & College Center. Supports after school tutoring labs in core subjects staffed by SRVHS teachers. Provides on-campus SAT/ACT test prep seminars & mock exams. Provides additional school library hours. The recommended donation is $595 per student. Without parent support, these and other academic support programs will not exist. Talent is universal, opportunity is not. You may donate in two payments. 1st installment paid now using online payment system. 2nd installment automatically debited from same online payment method 60 days following the first. Installment option available online only through the SRVHS Future Fund site during summer registration. Your donation is tax-deductible to the full extent provided by law. No goods or services were provided in exchange for your contribution. Academic boosters is a 501(c)(3) non-profit organization. TAX ID: 68-0398728.